TOKYO — Toyota Motor Corp. and Panasonic Corp. are setting up a joint venture to research, manufacture and sell batteries for ecological autos, an increasingly lucrative sector amid concerns about global warming. 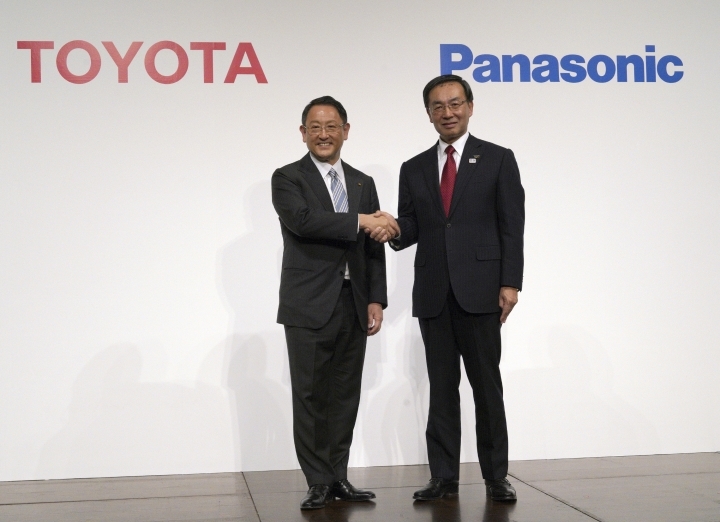 The Japanese automaker and the Japanese electronics maker said in a joint statement Tuesday that Toyota will take a 51 percent stake and Panasonic 49 percent in the joint venture, which is to be running by the end of 2020. The companies have been studying working together on batteries since 2017. They did not say how much would be invested in the joint venture. Panasonic will transfer equipment, assets and workers from its plants in Japan and China to the joint venture, which will employ 3,500 workers from both companies. Separately, Panasonic already has invested in a battery factory with U.S. electric car maker Tesla Inc. Innovations in batteries are critical for electric vehicles, with charging times and costs key obstacles. Toyota, Japan's No. 1 automaker, is thought to have fallen behind rival Nissan Motor Co. in pioneering electric vehicles, and has been trying to catch up in recent years. The companies said the auto sector was trying to meet various challenges that require innovation, including autonomous driving and car-sharing services. "Today's automotive world is also being called on by society to help find solutions to such issues as those related to global warming, resources and energy," they said in a joint statement. Copyright © 2015 - 2019 Culture - Asean Coverage. All Rights Reserved.